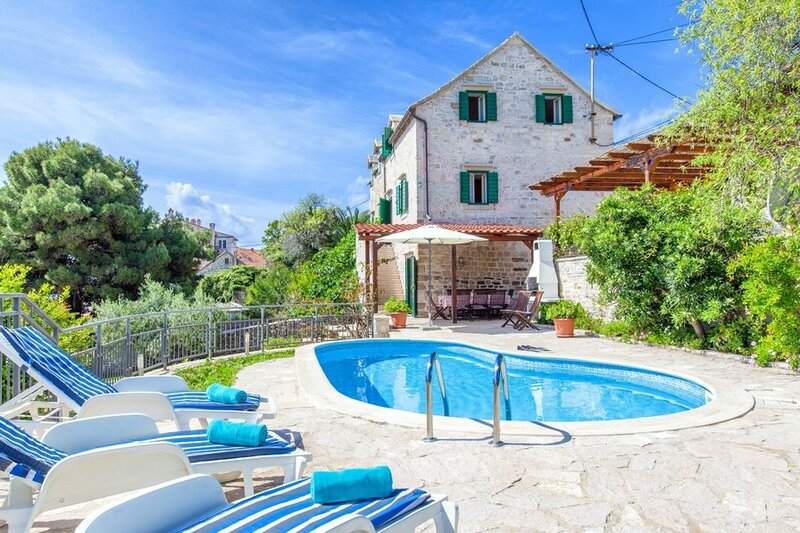 Located in the center of Sumartin, villa under the name which on Croatian means „tranquility“, has everything you need on your vacation: beautiful view of the sea, vicinity to the beach, ferry and bus station and it is surrounded by numerous bars, taverns – restaurants of traditional Dalmatian food and supermarkets. If you ever wondered whether it is possible to buy fish taken from the sea int hat given moment, we give you the answer: it’s possible! And it is possible right here: this traditional stone house is located in the port where fishing boats full of seafood arriving daily. You can buy them right from the friendly fishermen or at a nearby store. Of course, do not feel obligated to swim in the sea (although we heartily recommend that you jump into our clean sea) because the villa in its carefully landscaped garden has a pool with deck chairs which you can use after lunch on the terrace with a magnificent view of the islands and the whole place. Beautiful view is provided from the upper floors where the bedrooms are: two with double beds and bathroom and a bedroom with two single beds will give you a perfect feeling of home because of the wooden furniture and a small but consistent and modern regulated space.